New packaging design contest on Desall.com: Bolton Food and Desall invite you to suggest innovative solutions for an original packaging dedicated to the Insalatissime Rio Mare ready-to-eat product line. Bolton Food is looking for new concepts for an innovative packaging dedicated to the Insalatissime Rio Mare ready-to-eat product line, inviting you to propose an easy-to-use and portable solution, with a distinguishing design. Insalatissime Rio Mare: the Insalatissime ready-to-eat line is a balanced, long-life “ready-to-eat” meal, made of fish salad (mainly tuna) combined with a mix of vegetables, pulses and cereals. The product might be consumed for the main meals or for a snack. Packaging features: you are invited to propose a packaging that might enable the user to consume the food directly from it, either holding it on a surface or in her/his hands, also thanks to a special piece of cutlery that you are invited to design (see Cutlery paragraph). The design shall distinguish itself from the current Insalatissime Rio Mare product size (see Material files) and shall be well visible on the shelf regardless of how it is placed. Besides, it shall represent a distinguishing element compared to competition. Cutlery: the piece of cutlery shall enable the user to easily consume her/his meal from the packaging itself and shall be kept right inside of it. The piece of cutlery you design shall be easy to use and practical to consume food, with a special attention to its size and ergonomics. Currently the piece of cutlery is fixed under the lid: you are either free to use the same solution or to suggest an alternative, keeping into consideration both the ease of use for the final user and its industrial feasibility. -	Easy reclosing of the packaging should the content not be consumed entirely. Shapes: the packaging shall have shapes at your liking, keeping into consideration that it shall provide good ergonomics, either while holding it in hand or when placed on a surface, suggesting design solutions that may enable the user to mix the ingredients and consume the food directly from the packaging easily. The packaging shall be perceived as a rich and complete portion, while it shall also sport a compact design, practical for transportation and for being consumed in mobility. In particular, the packaging you suggest shall have a horizontal development (not vertical), with smooth shapes and possibly reminding with its shape of a plate or some other elements usually associated with consuming food. At your discretion, you may include transparent elements on the packaging to highlight the quality of the ingredients, that may be kept separately, still giving maximum visibility to the fish that shall constitute the main ingredient of the recipe. You are invited to preferably include a lid. Style: your packaging shall constitute an innovative element for the brand and for the product typology as a whole, also compared to competition, asserting itself an original yet coherent solution with the food product typology it belongs. Size: consider that the packaging you propose shall be dedicated to a 190g portion, equal to about 250ml volume. Colour: in order to let the brand be easily recognised, the packaging shall use the pink colour of the Insalatissime Rio Mare product line (see Material files). Materials: the packaging might be made of metal, plastics or other similar materials suitable for direct contact with food. In order to convey a perception of quality and freshness of the product you may consider the use of transparent materials to let the content be seen through the pack. As far as the piece of cutlery is concerned, suggest the use of biodegradable material producible with industrial technologies. The following materials are not allowed: glass, external cardboard to wrap the packaging. Surface finishings: at your discretion you may suggest the use of some relief elements on the packaging or to alternate glossy and matte elements. The packaging might be wrapped with labels or transparent sleeves. Logo: for the aim of the contest grant proper space for the Insalatissime Rio Mare logo (provided in the Material files), that shall be well visible both on the top and on the side of the packaging. Values to convey: the packaging you suggest shall reflect the values of Insalatissime Rio Mare, that is a modern, tasty and attractive meal, made of quality and varied ingredients, a balanced and nutritious meal, that combines the quality of the food with the need of consuming the meal on the go. It is a unique and playful product in its genre: accordingly the packaging shall be able to convey this uniqueness. An aspect that will be judged with great interest is the reinterpretation of the “canned food” concept that is sometimes perceived negatively, rather moving to a new communication approach that may exalt the freshness and quality of the ingredients. Customer typology: the product addresses a very ample, unisex and multi-age public, with a particular focus on the under-45 adult segment, with a modern and active lifestyle, looking for both a practical and satisfying meal in terms of taste, quality and nutritious intake. Often the customers have already the habit to consume ready meals or buy products used to create easy-to-prepare dishes, with fresh ingredients. Deliverables: upload all the images that better present your projects (rendering, descriptions, CAD files, etc. ), using renderings, sketches or other modalities, as long as your concept is well described with annotations and dimensions. We remind you that you may also attach a .ZIP archive containing extra materials, including 3D files that might be very useful for a better evaluation. Participation is free of charge and open to designers and creative talents of any nationality aged 18 years or older. Participants can present one or more projects, but only the projects published on the www.desall.com web site, via the upload page related to “Rio Mare Packaging Award” will be accepted. The selection of the winner by Bolton Food will be the result of an unquestionable evaluation and it will take into account originality, feasibility and consistency with the brief presented. 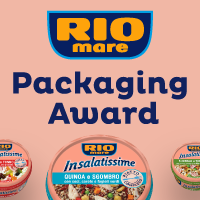 Do you want to stay updated about "Rio Mare Packaging Award"?